I may attack a target within two (2) zones with a conjured blob of acidic goo while Carefully Arcane. If I get a boost using this attack I may upgrade it to place the spell Aspect Acidic Aftermath to the target, which is invoked at the beginning of each of the target's turns to inflict one (1) additional shift of stress from acid damage on the target. This Aspect can be removed by various means by overcoming a Great (+4) difficulty. Create Advantage while Sneakily Arcane vs an Epic (+7) difficulty to attach the spell Aspect Black Tentacles! to a zone up to two zones away to summon a Black Tentacles construct and cause it to attempt to entangle all targets in the affected zone and also prevent entangled targets from leaving the affected zone. See the Black Tentacles servitor profile for details. Limitation: An immobile construct anchored to its zone. Magical Construct: Reduce stress caused by all physical and magical damage by two (2) unless the stress is caused by something involving positive energy. Create Advantage while Sneakily Arcane vs a Great (+4) difficulty to attach the spell Aspect Lesser Black Tentacles! to a person and the zone that they are in up to two zones away to summon a Black Tentacles construct and cause it to attempt to entangle the target and prevent them from leaving their current zone. See the Lesser Black Tentacles servitor profile for details. Create advantage while Carefully Arcane vs an Average (+1) difficulty to add the spell Aspect Dense Fog to my zone or an adjacent zone. When I cast this spell I can choose to spread it to cover additional contiguous zones at the cost of one (1) Fate point per additional zone. This spell Aspect provides active Good (+3) defense against notice attempts and targeted abilites and it takes one additional zone's worth of movement to traverse the affected zone. The spell Aspect lasts for an entire scene or until it has no invokes remaining. Create advantage while Flashily Arcane vs an Average (+1) difficulty to conjure a dust or powder like substance that immediately catalyzes with a glimmering sparkle that coats everything in the zone and disrupts most invisibility and stealth related effects in my zone or an adjacent zone. I take a -1 penalty on my roll, but I add the spell Aspect Glimmerdusted to anyone in the affected zone that has an Invisibility related (or similar effect) Aspect active. While someone has one of these spell Aspects active on them their Invisibility Aspect is suppressed; each exchange each of these Aspects is automatically invoked to continue suppressing relevant Invisibility effects. Each spell Aspect lasts until there are no invokes remaining. Summoning magic is handled using the servitor guidelines. Create Advantage while Carefully Arcane vs a Good (+3) difficulty to attach the spell Aspect Murder of Crows! to a target up to two zones away to summon a mob of angry crows and cause them to attack and harry the target. See the Murder of Crows servitor profile for details. Create advantage while Sneakily Arcane vs a Mediocre (+0) difficulty to add the spell Aspect Obscuring Mist to my zone or an adjacent zone. This spell Aspect provides active Average (+1) defense against notice attempts and targeted abilites. The spell Aspect lasts for an entire scene or until it has no invokes remaining. While Cleverly Arcane I may attack a target within my zone or an adjacent zone with a blast of planar energies from either the Positive or Negative energy planes (chosen when cast). If I had cast this same spell in my previous exchange I gain a +1 bonus to cast this spell in the current exchange. I cannot split the shifts of my attack when using this spell. Create advantage while Cleverly Arcane vs an Average (+1) difficulty to attach the spell Aspect Slippery! to either a zone, a person, or an object for very different effects. If attached to a zone the Aspect causes the ground to be very slippery, increasing the likelihood that people moving on the ground in the affected area will fall down or lose their balance. If attached to an object it makes the object extremely difficult to hold on to. If attached to a person it makes the person difficult to hold on to and also makes it difficult for that person to hold on to anything else. In all cases the Aspect can be invoked as appropriate to the narrative given the slippery situation. The Aspect lasts for one (1) scene or until no invocations remain. Create advantage while Carefully Arcane vs a Legendary (+8) difficulty to summon a barbazu, which will appear directly before you in your zone. The barbazu is obedient and will either guard you or attack your enemies at your command for the remainder of the scene or until taken out, returning from whence they came afterwards. 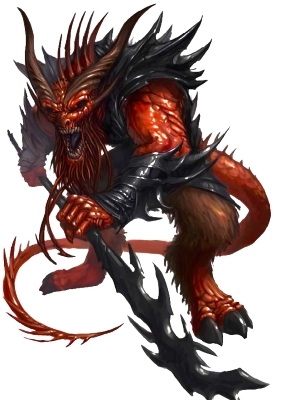 Barbazu are warrior devils, good at fighting and not much else. 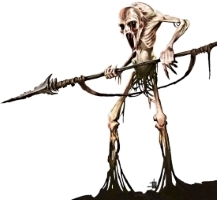 A barbazu typically carries a glaive or other weapon with which it can strike at foes beyond its normal reach, but given the opportunity a barbazu will pull a foe close and impale them upon their spiny beards. A babau is around 6 to 7 feet tall and weighs over 200 pounds. They are quite ugly and fierce looking. Diabolic Durability: Because my infernal nature makes me much more durable than normal, I reduce by two (2) all stress inflicted on me by physical attacks. However this does not work against magic, cold iron, or weapons blessed by a benign deity. Diabolic Immunity (-3): Because of my infernal nature, I am immune to electricity, fire, disease, and poison. However, positive energy inflicts two (2) extra shifts of stress against me. Create advantage while Carefully Arcane vs an Average (+1) difficulty to summon an imp, which will appear directly before you in your zone. The imp will obey one simple command to the best of its abilities and will return from whence it came after it has completed the task or been taken out. Extra successes when cast may be spent to add more commands on a 1:1 basis, or to increase the complexity of a task the imp can be given as negotiated with the GM. a tiny, invisibile, flying, and annoying type of devil. Create advantage while Carefully Arcane vs a Superb (+5) difficulty to summon a mob of three (3) nupperibos (i.e. a Nupperibo write up with 9 hit boxes), which will appear directly before you in your zone. The mob is obedient and will either guard you or attack your enemies at your command for the remainder of the scene or until taken out, returning from whence they came afterwards. Extra successes when cast may be spent to add two more hit boxes to the mob; every three hit boxes represents one more individual in the mob. Nupperibos are not very powerful, but they can take a hit. Treat Nupperibos as a mob, adding +3 stress per additional Nupperibo. I may overcome while Cleverly Arcane to immediately teleport myself out of the scene by overcoming a Fantastic (+6) difficulty. My range is limited to somewhere within approximately fifty (50) miles of my current location. When using this ability I can not move a zone in the normal way, and if I fail the spell I go nowhere at all. I cannot cast this spell while engaged in a conflict. I can use extra shifts on a one to one basis to carry willing travelers who share my zone with me when I teleport. I may overcome |while Cleverly Arcane| to immediately teleport myself out of the scene by overcoming a Legendary (+8) difficulty. My range is limited to somewhere within approximately five hundred (500) miles of my current location. When using this ability I can not move a zone in the normal way, and if I fail the spell I go nowhere at all. I cannot cast this spell while engaged in a conflict. I can use extra shifts on a one to one basis to carry willing travelers who share my zone with me when I teleport.